Whether you’ve seen him strolling down the halls with his signature swagger stroll and one headphone in, at Buffalo Wild Wings with his best friends on the weekends, or making the winning play on Niles West’s varsity football team, junior Nick Johnson is everywhere. It’s hard to NOT know who he is, but few people truly know the true Nick. Determined, driven, and unstoppable- Nick is more than the average sixteen year-old. Born and raised in Chicago until he was six, Nick moved to Skokie in first grade, and attended Fairview South School. One day in first grade, Johnson attended his cousin’s football game, and it was then when Nick himself had the desire to play. He started playing flag football in first grade. In third grade, he moved up to the fifth and sixth feeder tackle football team for Niles West. “My dad played football at Knox College, and he was my coach for feeder. He’s been to all my games and practices all these years, and has always supported me,” Johnson said. With his consistent family motivation and an astonishing eleven (and counting) years of hard work in games and practices, Johnson’s passion for football grows bigger and bigger. Without a doubt, he knows what he wants to do with his life: become a professional football player. “After college, I don’t really have a Plan B. Having a Plan B leaves the possibility of Plan A failing,” he said. After graduating, Johnson hopes for a D1 schloarship at his dream school, Texas A & M University. By the looks of it, Plan A has an immense chance of working out. Not only was Johnson co-MVP of the 2012 football season, but he made All-Conference, and trains three days a week at the Athletic Republic in Winnetka. Tommy Williams, a senior, and teammate of three years, had nothing but good things to say about Johnson. 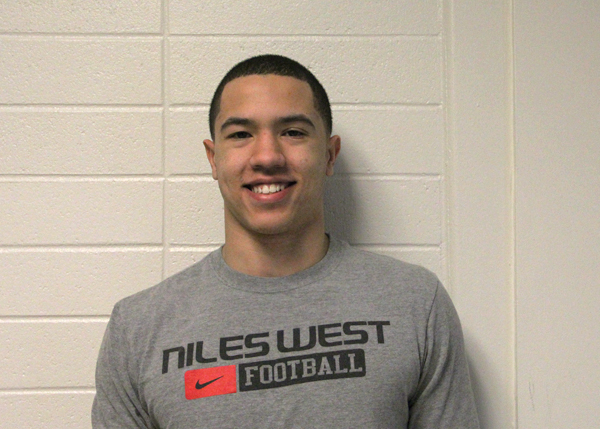 “Nick is the future of Niles West football,” Williams said. Although outside of school his main focus is football, Nick still has time to be on the executive board of WolfPack, and also contribute as a team member on the track team here at Niles West. Garrett Iverson, Nick’s best friend, and also teammate on both football and track, explains the chemistry him and Johnson have when they’re out on the field doing their thing. “We’re both safeties on football, so we’re pretty much always working together. And in track, when we run relays together, I’m in the first heat and he’s in the second heat, so when we’re competing, I have to pass the baton to him. Believe it or not, that trust and communication builds a good foundation for our friendship. I basically have a sixth sense about him,” Iverson explains. “You get out what you put in,” Johnson replied. When Nick’s not training for his future, he enjoys hanging out with his best friends, known as “The Squad,” listening to Drake, Meek Mill, and J. Cole, and munching on some grub at his favorite restaurant, Harold’s Chicken Shack in Chicago. Although Nick’s lived in the Niles West district most of his life, he had offers to play football at Loyola Academy and Notre Dame High School, but chose to stick with West. OMGGG GRETCH YOUR STORIES ARE THE BEST, I LOVE THEM!!!! IM A FAN AND I WISH I CAN BE YOUR BFFFF. I ALSO THINK NICK IS A HUNK. “strolling down the halls with his signature swagger stroll” ? I agree, the writing is quite juvenile and not well developed. It has potential though! You guys should do a story on Nick Vickers. dude is a straight up jock…….. Pretty cool that he trains at Athletic Republic alot, it’s a great place.